Claudene Christian, a fifth great-granddaughter of Fletcher Christian, who led the famous mutiny against Captain William Bligh on the HMS Bounty in 1789, perished today when the replica Bounty was damaged in Hurricane Sandy. Claudene was a member of the crew aboard the replica Bounty that was constructed for the 1962 movie Mutiny on the Bounty. She had always been interested in the ship because of her ancestry and joined the crew in May of this year. 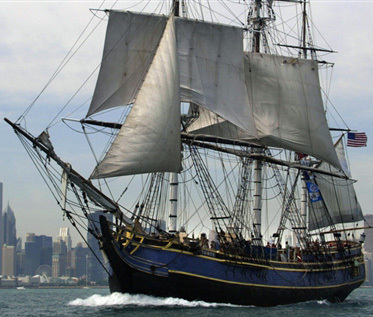 The Bounty left Connecticut last week headed to St. Petersburg, Florida. It was caught in Hurricane Sandy on Monday afternoon and heavily damaged. Fourteen of the sixteen crew members were saved by a U.S. Coast Guard rescue team. Claudene was found unresponsive in the water and passed away in an Elizabeth City, North Carolina hospital this evening. I knew Claudene from when I was in the USC Marching Band. She became a song girl (cheerleader) in her freshman year, which was my last year in the band. My deepest sympathies to her family and to the greater USC family on her passing. Thanks for posting this. I'm a fan of ships and the sea (also genealogy) and wondered about the surname "Christian." I'm very sorry about your friend. Thank you for writing. I guess with the surname "Christian" and the Bounty, you would have to wonder, wouldn't you? My sympathies to her family - and I hope that someone has that famous family tree documented somewhere. It would be fascinating to see. It would indeed be interesting to see the family tree. I've received two calls this morning from news agencies asking me if Claudene really was a descendant of Fletcher Christian. Under other circumstances I might try doing the research to verify it, but since I knew her, I would feel uncomfortable if I found out the claim wasn't accurate. My sympathies to the family too. I'm a sixth great grandchild of Fletcher Christian which would make Claudene and myself somewhat distantly related. If you do research and need assistance with descendants of Fletcher Christian I can provide some information. Interesting reading and very sad about the loss of life on the Bounty. How did you go with your hunt on history? I am from Norfolk Island and also a descendant, I would be interested to hear as I have some knowledge or this matter. I chose not to do the research myself because I knew Claudene. I put the reporters who contacted me in touch with another descendant who e-mailed me. I don't hear what the results were, unfortunately.